Inside: Help your young Star Wars fan learn valuable skills with these Star Wars cutting practice worksheets. They’re the newest addition to the printable activities for kids collection. Practicing and mastering the use of scissors is an essential skill for preschoolers. In fact, it’s one of the things they need to know before they start kindergarten. But, when all this practicing ends up with a million 1/8″ paper pieces strewn all over your floor, you find yourself a little less inclined to let your toddler go to town cutting paper. Sometimes, even after I clean up and vacuum, I’ll still find random pieces on the floor over the next few days. But, I know my 3-year-old still needs to work on his fine motor skills, so I came up with these Star Wars scissor practice worksheets. He’s not very experienced with scissors so I don’t expect him to be able to do all of these activities by himself, but they’ll be great practice for him as we go forward. And I know these worksheets will interest him because he loves Star Wars! If your child loves Star Wars too, be sure to check out this giant collection of Star Wars activities for kids. Read on to download your own free copy of these Star Wars cutting practice printables. This counting worksheet (above) is great for mid-skill levels. There are only straight lines, which are easier to cut, but the lines are closer together and require more accuracy to cut out the shapes. Once your child has cut out the numbers, they can use a glue stick to paste the correct number into the empty squares. This Star Wars worksheet is great for beginners because there are only straight lines and there is more space to cut around the droids. After your child has cut the lower half of each droid out, have them glue them to the correct upper half of the droids on the left side of the paper. In this worksheet, kids can work on cutting smoothly on a curve. This can be a little trickier for young hands, so don’t be discouraged if they aren’t able to do it on the first try. Finally, there’s a classic cutting practice worksheet that has a straight line, a curved line, a wavy line and a zigzag line. These Star Wars worksheets are so much fun for kids learning how to cut and hopefully (fingers crossed) you won’t end up with tiny pieces of paper all over your floor when they’re done! Also, don’t forget if you want to save on ink, you can print these out in black and white as well. 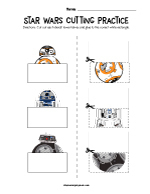 Enter your email address to download your free Star Wars scissor practice worksheets.